We last left off around breakfast time on my second day in San Francisco, so let’s pick up there, shall we? 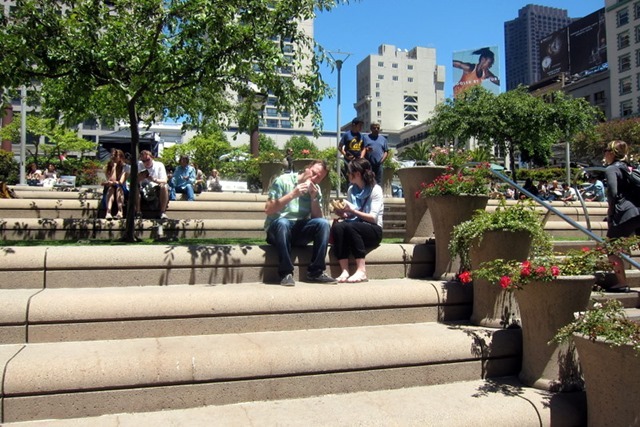 After breakfast, we walked to Union Square, a beautiful park in the middle of San Francisco, to check out the main event that was sponsored by Smartfood. 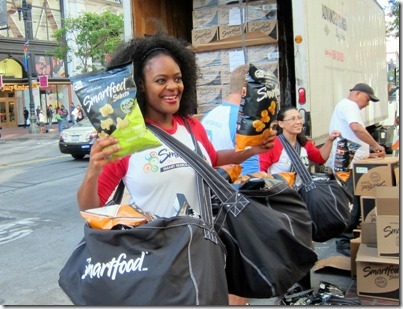 Smartfood took over the park and throughout the day team members passed out full bags of Smartfood popcorn, hummus popped chips and puffed corn to San Francisco residents and visitors. 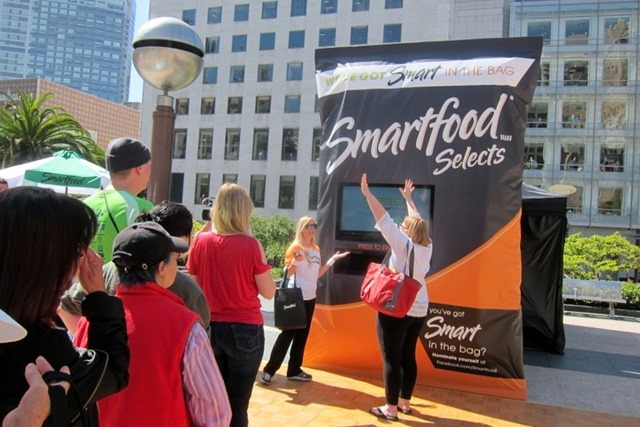 The brand reps were stationed at various spots throughout the city, so it seemed like everywhere we went that day we saw people walking around with full bags of Smartfood snacks. It was a city takeover! If you can get your hands on a bag of Smartfood Selects Sour Cream Onion Puffed Corn, I highly recommend it. It was my absolute favorite! 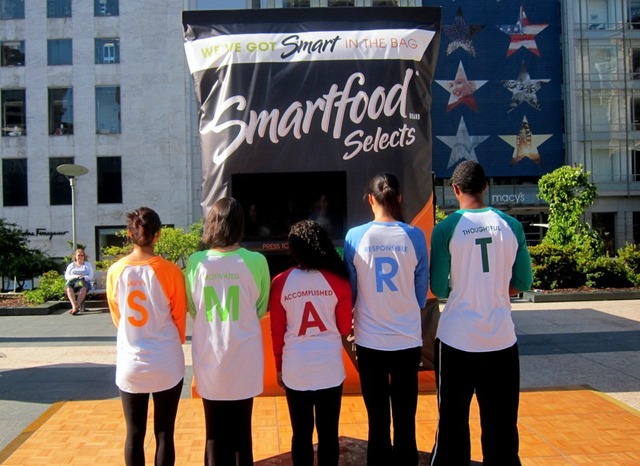 Smartfood, with the support of SELF magazine, came together to create a list of the top 10 SMARTest cities in America, based on a number of criteria. 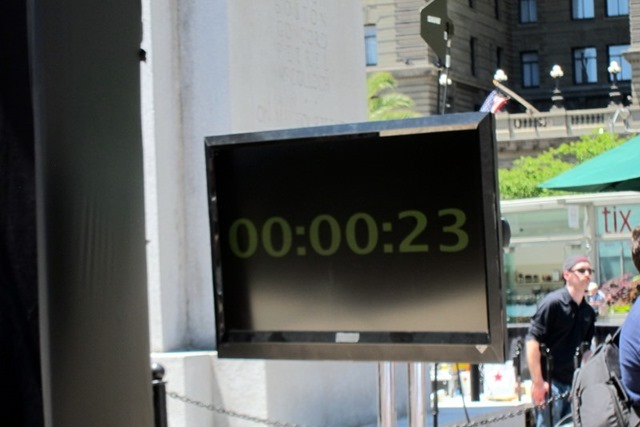 San Francisco claimed the top spot, so the big event that took place yesterday unveiled this exciting announcement and congratulated the city on their efforts to live SMART. 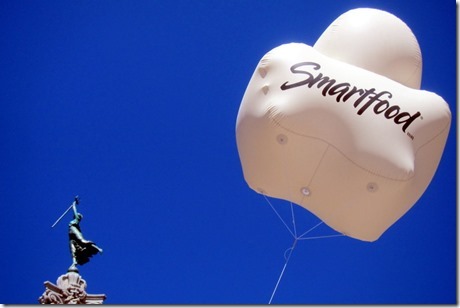 The brand broadened and redefined the word “SMART” and created an acronym that spoke to the five criteria the company took into consideration when determining the SMARTest city. 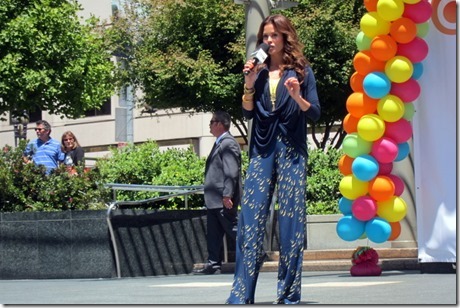 At around noon, the big announcement was made by Brooke Burke-Charvet! Sarah and I joked that you can spot a celebrity by their fabulous hair. Our group of bloggers had the chance to briefly speak with Brooke in a round table format and she seemed like a very kind person. It’s clear that she is very family oriented and believes in living an active lifestyle. I had such a good time chatting with Marissa. She was such a fun person! Marissa was absolutely bursting with energy and fitness is clearly a huge part of her life. She was so passionate when she spoke about exercise that it made me want to bring her back to Florida with me to motivate me on days when I’m feeling less than enthusiastic about my workouts. She is only 30 years old and I was so impressed by all that she has accomplished in her writing career. 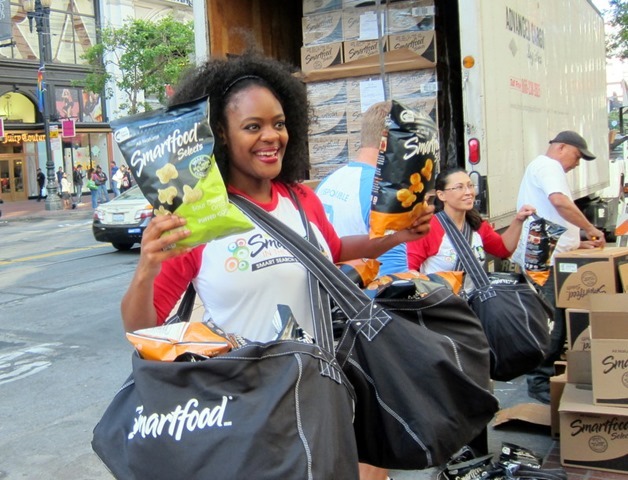 In addition to announcing San Francisco as the SMARTest city, Smartfood unveiled its search for the SMARTest woman in America – someone who embodies the same positive attributes as the SMARTest city. 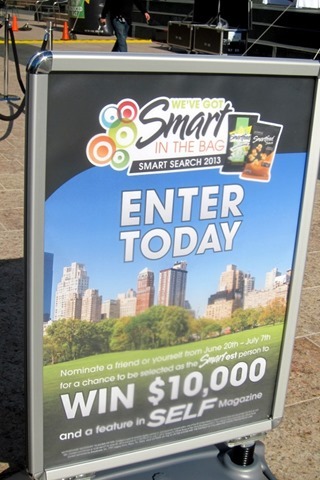 If you think that you or someone you know is savvy, motivated, accomplished, responsible and thoughtful, you can visit the Smartfood Facebook page to submit your nominations for a chance to win $10,000. 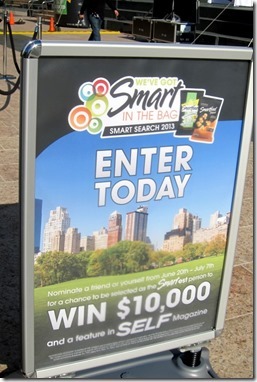 The winner will also be featured in SELF magazine and everyone who enters will receive a buy one, get one free coupon for Smartfood products. Apparently those of us who live in the south need to step it up! 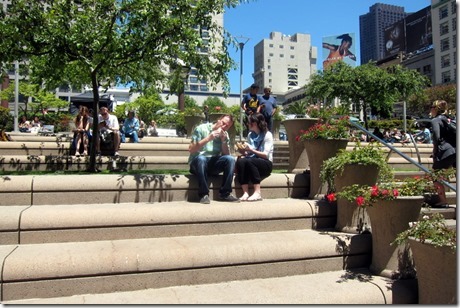 The rest of the day at Union Square was spent enjoying the fun games and contests that took place all around the park! My favorite game of the day was a trivia game that gave prizes to everyone who correctly answered a trivia question. I am a big fan of trivia, so this was right up my alley. I ended up winning a water bottle! The kid behind me won a Kindle! The prizes were really awesome and included $50 gift cards, Kindles, solar phone chargers and more. 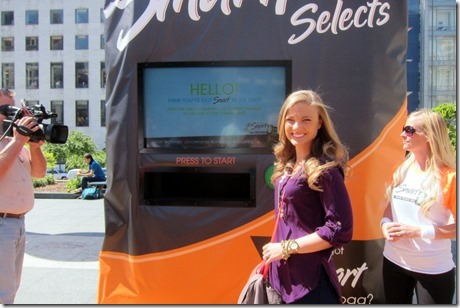 It wasn’t your typical “here’s a keychain with our logo on it” kind of promotional trivia game. It was very popular and a long line formed early in the day and lasted through the afternoon. Another activity that was quite popular was the rubix cube challenge. 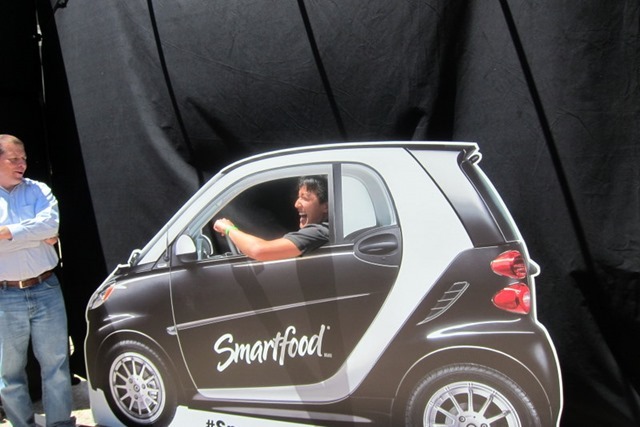 There were professional rubix cubers (that can’t be a real word) who came out to compete for the chance to win a Smart car! The man that won completed it in 23 seconds! He said his record was 11 seconds, which is unreal. Apparently there’s a strategy to it that doesn’t involve peeling off the stickers to win. Who knew!? During our time at the park, I also had the chance to meet a bunch of you guys who stopped by to say hi and I want to say a big thank you to those of you who took time out of your day to hang out with me! It is always so fun to meet readers, so I really appreciate it! Once the event was officially over, before heading back to our hotel, Sarah and I needed a real meal and stopped for lunch. 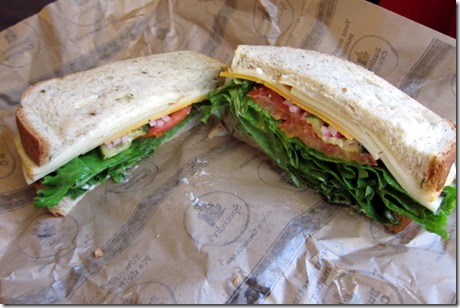 I ordered a three cheese sandwich on herb bread from Specialty and inhaled it! We also stopped at La Boulange for macarons. 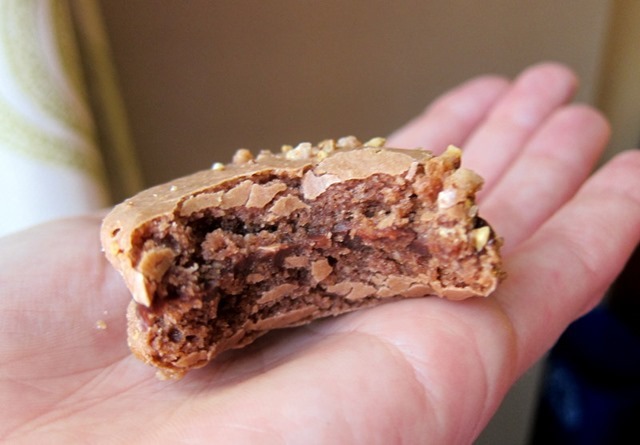 The chocolate hazelnut macaron was fabulous and reminded me of a melt-in-your-mouth Ferro Rocher candy. Thank you so much to Smartfood for such a fun day in San Francisco! What is something that your current or past hometown does that you think is admirable? 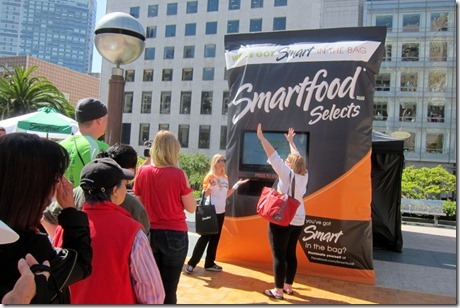 Disclaimer: As I previously stated, my trip to San Francisco was sponsored by Smartfood. It was a wonderful trip and now I’m dying to go back and explore the city in depth in the future! Woohoo for Austin, Texas!!! Though I’m originally from Laguna Hills, California and miss the ever-so-perfect weather, living in Austin is JUST as grand. (: Glad to see they’re number 4!! I tried watching the video but it says it’s private! Agree! Mine said private too. I wish they had Smart food in Australia so I could give it a try. Ah how much fun! San Fransisco looks like a fun place. Sour cream and onion flavor is the best so I need to get my hands on some of those! Seriously sounds like a ton of fun. And totally neat you got to see Brook Burke in action. I can’t view the video either. Says it’s private! SO jealous of your trip! I love that giant inflatable bag they had! 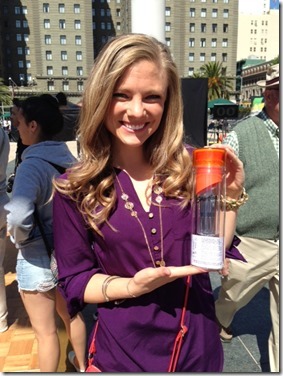 I would kill to have won a kindle, a water bottle is a pretty great second though ;). What a great trip! From the pics, the weather looks like it has been gorgeous! I really like Brooke Burke! I have a number of her workout DVDs and they’re awesome! 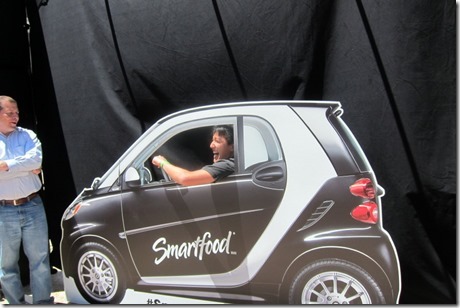 Smartfood goes BIG at these events!! 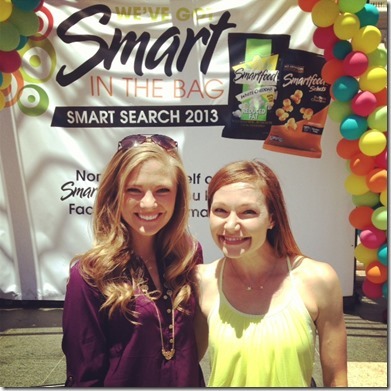 I LOVE the Smartfood products!! And if your theory about celebrities and hair is true, then you should be a celebrity because your hair always looks fabulous! 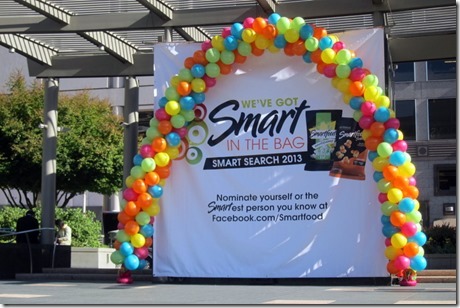 BIG Smartfood fan…Looks like as a corporation, they really have everything VERY well planned and executed! Your method of describing the whole thing in this piece of writing is really nice, all be capable of without difficulty understand it, Thanks a lot. Small world – I started reading your blog because I live in Orlando now and like to hear from people nearby, but I grew up near Marissa – we probably played soccer together as kids! Fun to see her here. What a fun trip Julie! I enjoyed reading all about it, almost felt like I was there! you’re making me miss home! i LOVE specialty’s. What a neat idea for a company to undertake. I’m sure it was very cool being a part of their endeavor! By the way, that sandwich looks delicious! San Fran is my FAVORITE city! Followed by DC 🙂 My hometown is tiny, and I can’t wait to move to a city when I graduate college. However, I love my little hometown. Back in the 60’s it was named Happy Town USA by Parade Magazine. It’s still got that classic small town Americana. It’s a wonderful place to call home. I LOVE Boston so it’s exciting to see they made the list. I hope to call that city my home again someday. This is so cool because I’m from SF! Glad you had a great time! When I lived in Boston for college, I loved that public transportation and walking (and biking) were SO normal- I didn’t even think twice about not having a car. Now, in Dallas, I do need a car, but I admire that the city is making a strong effort to increase the number of walking/ running/ biking trails. Great trip recap! What an amazing event! I need to try that popcorn now. My hope is Omaha will be pretty fit, its so great to be surrounded by motivating people. Looks like you had an awesome time! San Fran is one of our favorite places to visit. My wife and I have been there twice, including our 25th anniversary. My most nerve-wracking experience was driving over the Golden Gate bridge. Beautiful view, but I thought I was going to hyperventilate. Visiting Alcatraz was probably the highlight of our visit. The best view of the ocean was when we ate at the Cliff House. A great view of the beach and ocean rocks. What a cool experience! I’m dying to go to Cali one day! And that macaron looks amazing. DROOL! San Francisco is one of my absolute favorite cities. It’s the one place I’d move if I could. It also doesn’t hurt that I have family there. Glad you had fun! In my 11th grade physics class, our teacher taught us the strategy to the rubix cube. For our final exam, we had to complete it in under 2 minutes. It was so cool to be able to do it. Wish I could remember!! Thanks for sharing all the fun facts about San Francisco. I had now idea it was just an “accomplished” city. I’d love to visit there and explore everything else it has to offer. A dream of mine would be to live in a city like that some day where most people are active and conscious of their health. 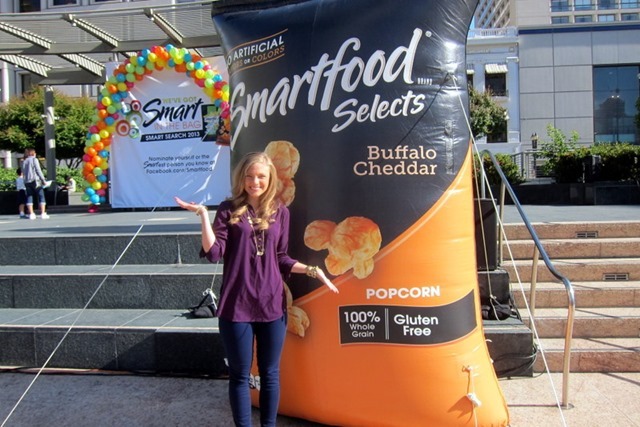 Ummm buffalo cheddar smartfood exists?!? I need it. That all looks like so much fun! I’ve never tried the Smartfood products, but I think I need to get some now. I love reading about all your trips, glad you had a good time! First of all, Smartfood white cheddar popcorn is heavenly! 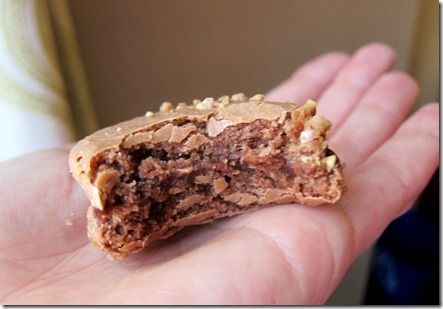 It’s one of my favorite snacks. Also, now I have to go to San Francisco…it seems like the coolest city. Thanks for the great recap of your trip! I love San Fransisco!!! I need to go back for a visit soon your pictures reminded me how amazing and beautiful it is! I live in Seattle and I’m not surprised to see that it’s #2. We have lots of amazing farmer’s markets, almost every one I know who lives here exercises regularly and eats healthy, it’s really great to be surrounded by like-minded people. I’m glad you had such a fun time in SF! It’s a great place. Oh my gosh–this looks like such a fun day!! I love all the games & prizes. The video says private… is there another way to view it? Damn! what a delicious event, So filled with good food and good people, my kind of environment, If only such an event was to take place in South Africa! We don’t do much in bettering the community fitness…an event like this would really lift some spirits.